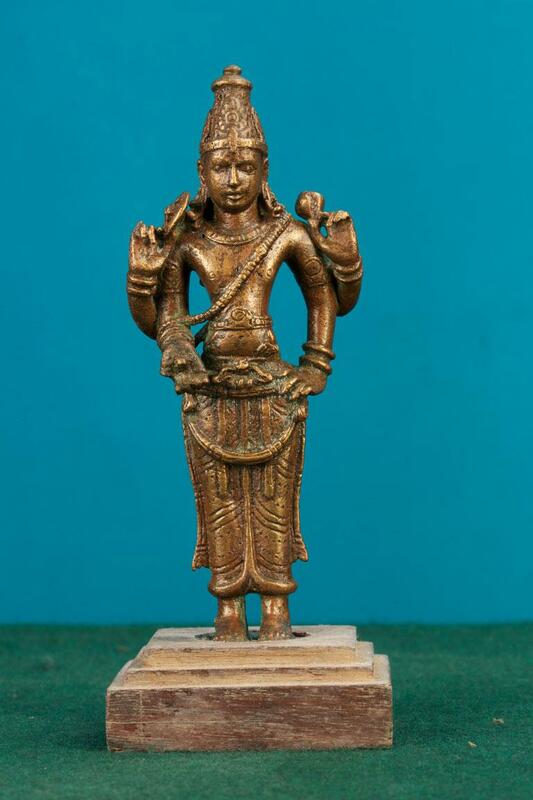 Here Lord Vishnu, the principle deity of Hinduism is standing two-handed. The headdress is conical and the hair is disposed in curly tresses at the back. The Makarakundalas pull the ear lobes to the level of the necklace. A plain disc is seen in the upper right arm and the lower right arm is in Varada pose with a lotus. The sacred thread falls over the fore arm. The upper left arm carries a conch between the thumb and the first finger. The katibandha bears on its clasp a lion faced device. Though somewhat crudely executed the image has form and dignity.